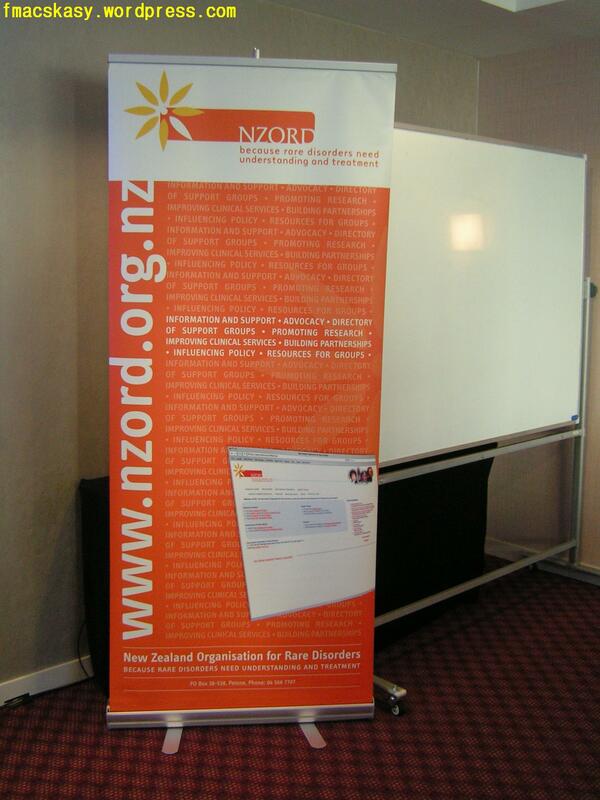 NZ, Wellington, 27/28 February – This blogger was invited to attend a forum held by NZORD (New Zealand Organisation for Rare Disorders). The Forum addressed issues and problems surrounding PHARMAC funding (or lack, thereof) for “orphan drugs” (see: Wikipedia – Orphan Drugs), for rare medical conditions such such as Pompe Disease. Until now, many of the folk involved (John Forman, Allyson Locke, and others) were just names and media stories to me. 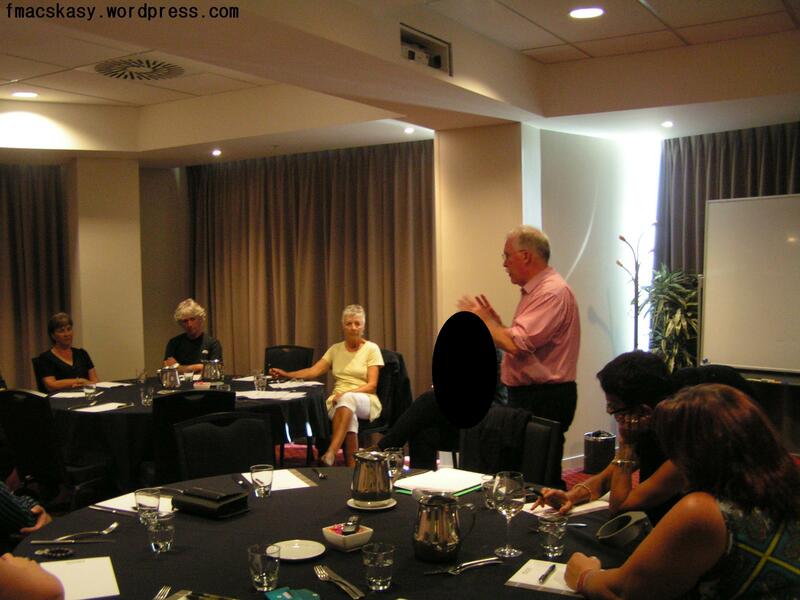 But on the evening of 27 February, when I met Allyson at Wellington Airport, and subsequently met John at Rydges Hotel in downtown Wellington – they became very real, engaging people. I was finally able to put people-to-names. And then I heard and learnt their own stories. What I found humbled me and made me realise that their stories and their problems with PHARMAC could be any New Zealander impacted by government policies. These were our stories as well as theirs. John introduced himself and explained his own situation, referring to two family member with a rare disorder. This has given him first-hand, intimate empathy with people living with rare diseases and disorders. He works in the dual roles of Executive Director of New Zealand Organisation for Rare Disorders and Chairperson for the Lysosomal Diseases support group. He has worked in this field, at first part-time and now full-time, for fifteen years. John then invited those present to give a brief introduction to their own situation. Daniel explained his rare disease – PNH – and that he is currently fighting to gain access for medication that is known to be a life-saving treatment for people with his condition. His group, The PNH Support Association of NZ, launched a media campaign this year to highlight their fight to access treatment for their condition. He said that the Pharmac process had been ongoing for twelve to fourteen months. His group are pushing for release of documents from Pharmac relating to their application for drug-funding. Daniel said he lives with a disease that effects his life on a daily basis, and was excited about prospects to help his, and fellow sufferer’s, situation. Paul said that his son is doing “really well” at present, but will be going back to Starship Hospital for further, ongoing treatment. Shannon explained that whilst her little boy was presently stable, there was currently no cure for the condition. “Je” has plasma infusions every week – not much fun for a three year old lad who should be out playing with his mates and doing all the things that other three year olds do. Shannon said that at some stage he will need “soliris” – “the sooner the better for a quality of life”. She hopes for funding in the near future, and in the meantime has been privately fund-raising. Shannon is asking ten thousand people to donate $1 a week, to pay for upcoming treatment with ‘Soliris’. She said they were a quarter of the way to her target with two and a half thousand people making $1 weekly donations, plus extra donations coming in from other fund-raising activities, events, and auctions. “I basically fund-raise non-stop… I’d like to basically give him a relatively normal life ,” she told the Forum. Despite Shannon’s soft-voice and demeanour, she held a steely determination to do the very best she could for her son. She is obviously not going to give up on him. Remember – just $1 a week! Told the Forum that her eleven year old son, “Co”, was diagnosed with a rare disorder two years ago. She said, “there is no cure, and there is no treatment”. Jo said that her family imports a drug from the United States called “genistein“, but it’s use is “purely a trial”. She said it may help to ease the symptoms. Jo said that “Co” is still walking – but his life expectancy was mid-to-late teens only. At one point Jo found it difficult to explain why she was attending the Forum, but said that it was good to be with other people who had “been through the same journey, and probably understands”. She referred to the “huge” implications of a late-diagnosed disease and ongoing battles relating to her son’s condition. Marianne is from Dunedin and both her adult sons are affected with the same rare disorder, MPS1. She said that whilst both her sons are “living relatively normal day-to-day with the condition, as much as they can”, there was no enzyme-replacement therapy that would be effective for their particular situation. Marianne said that they were living their lives in the “present day like kids would their age” but that the disease might not manifest problems until they were much older. She said she was attending the Forum to be kept up to date “in the loop”, and appreciated that others who were present, had a “hard journey to make”. Brenda’s family in the UK had been devastated by a rare disease and told the Forum that “it’s now working it’s way through family here”. Brenda’s granddaughters have not been tested yet, and said that was “a shock yet to come”. She says her daughter, “D”, has Fabry diagnosis – hence a 50/50 chance that her two granddaughters may also have the disease. Brenda said she had been “a bit naive all my life”, thinking that “when you got sick, you got treated”. But she said she was horrified to learn that even living in a developed country that was not always the case. Brenda said she wanted to help, “I want to do something, I don’t know what….just to do something, to kick arse!”, which prompted laughter from the Forum attendees. Jane told the forum that her condition was often just a chronic disease but in her case was more serious. She’d recently sought an opinion from our nearest centre of excellence for the disease in Melbourne where she was told that despite having ‘a performance level of 0’ and being ‘extremely well’ she is now in the ‘high risk’ category. The specialist described her as being “a really good ice skater but that the longer she skated the thinner the ice”, and she could “crash through” at any moment. Quite liking being alive, Jane’s uses her skills and resources to challenge and achieve opportunities. She expressed her determination “to get what I need“, and referred to her “terrier” nature; getting her teeth in; and not letting go, but it takes huge effort. Jane said “the rules of engagement are not explicit” and it is hard to work them out. They [the system] expected people in her situation to follow a certain “role”. She said if you altered that, it can make a big difference, but not everyone could do that and many would just walk away. A treatment is available in many other countries for people categorised as high risk however, it’s not available here. She has decided to self fund even if it means becoming “houseless” in the process. However she expressed real concern and called it “dreadful” that someone else with similar health status but without her resources would just have to accept that only supportive care would be available for them. Susan and Jane have been friends for the last 20 years and as she put it, “it’s a helluva journey to be a support person“, and immediately expressed her feelings at what she had heard from others at the Forum. Susan launched into a well-reasoned, articulate description of the system. She also said that whenever they go to Capital Coast Health [Blogger’s note: Wellington Public Hospital as it was once called, in simpler times], it was as if they were teaching them that they were people first and patient second. Susan referred to the “ease with which judgements are made” with regards to Jane’s situation and that often it was necessary to challenge what was behind the judgements. She said not knowing how the system worked that made being proactive in support of Jane more complex. For example under what criteria would a person qualify for special assistance and does a successful application come with additional funding. Dr Greg Coyle explained that he is a principal advisor to the Salvation Army who has written a thesis on exploring the boundary between what was provided to an individual, compared to what was provided to society as a whole. His thesis explored how fairness came into the issue. He said it was a policy analysis, and looked at how the system worked and did not work. See: How does the operation of PHARMAC’s ‘Community Exceptional Circumstances’ policy align with the distributive justice principles of fairness and equity? He said he looked at how disadvanged people have huge barriers put in front of them for the normal and simple things in life. Dr Coyle advised the Forum that he would explain his thesis, in more depth, tomorrow. Freda, of Ngapuhi, greeted the Forum in Te Reo. Freda told the Forum that twentyone years ago, she had been diagnosed with “acid maltose glycogen deficiency” – aka Pompe Disease. In fact, Freda was the first person in New Zealand ever to be diagnosed with the condition. At this point in her life, Freda had a young, three year old son, and her oldest son was getting reading to go to Boarding School. And now she’d been diagnosed with a condition for which there was no known cure. She asked the specialists, “Well, what do I do?“. Freda did live to see her 40th birthday, and in her own words, celebrated the event with a “hua of a party – two days, we partied!”. And every birthday party since then has been an unbridled celebration of another year lived, and the disease kept at bay. Freda says that whilst it is her pure determination that has kept her going, that it is getting harder for her to walk and get around. Freda then shared with the Forum the chilling fact that she had applied three times with Pharmac for treatment – and had her application denied all three times. She said she had been given a “host of reasons“. When asked by this blogger if she would apply again, Freda said she was considering a fourth application. She said she was thinking about it. Having just become a grandmother, and seeing another granddaughter come into the world in three weeks time, Freda said she wanted to take them to Kapa Haka; she wanted to take them to ballet. “Because trust me,” she said, “both my grand-daughters, they’re going to do ballet“. Freda said she wanted to sing to them, as she had done for her sons. She then wondered if it was worth putting in a fourth application, and suffer the emotional let-down? She said, “stuff it, I don’t want to be let down again“. “I’m getting tired. I’m so tired… It’s a struggle. I think all of us are in the same boat. Be it your daughter. Be it your son. Be it yourself, we’ve all been there“. 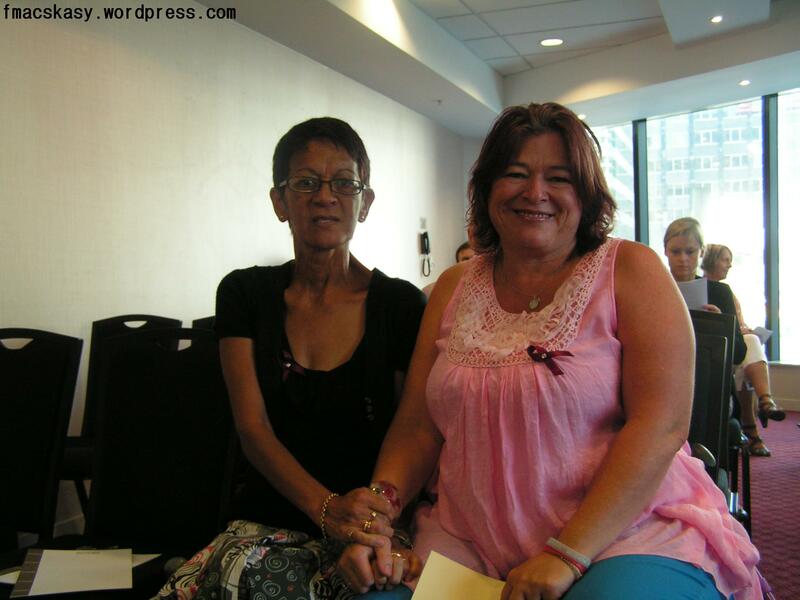 It was something that this Blogger noticed; Freda and Allyson seemed to have a special bond. Closer to being sisters than friends. I wondered if their mutual support for each other gave them both added strength – to keep going despite constant rejections for medical treatment, and a looming future that was bleak. “…All of us are struggling. None of us should have to struggle this hard to get treatment. Just having the disease is bad enough. Why should you have to grovel to Pharmac and have them say ‘no, you’re not worth spending the money on’. But we’re going to die if we don’t get help, she said. Allyson added that she was one of the “lucky few” who was part of a drug-testing trial. Every two weeks she had to travel to Brisbane for treatment. This routine takes place every two weeks. It should be pointed out that Allyson uses an electric mobility-scooter; tires easily; and has difficulty breathing by late afternoon. She can stand, but not walk for more than a few steps. Imagine the outrage if a government attempted to force a similar wheelchair bound person – suffering from a disease that could be treated easily here in New Zealand – to travel overseas every two weeks. The stress of this constant travel cannot be helping Allyson’s already weakened state. However, Allyson expressed her gratitude that she had the option of engaging in the life-giving drug trial. Allyson knew she was one of the lucky ones. She pointed out that Freda is already too frail to make the flight to and back from Australia. Freda has not even been given the choice of participating in the drugs trial. She is receiving no treatment. Freda is simply awaiting her fate. Jenny is also a mother to a son, “Ha” and daughter, “Sa”, who have a very rare disease – in fact the only two people in the country with this particular condition. She said that her role is to fight for good clinical outcomes. Jenny said that managing her children’s rare disease has been difficult, and pointed out that there have been many times when “Ha”, in particular, has been put at risk by the inaction of her local DHB. Jenny therefore has many roles; organisational administrator, advocate, and a mother. Chris is Chief Executive for Muscular Dystrophy Association of New Zealand. He said that Freda and Allyson were the reason that he was attending the Forum, as Pompe Disease was also a neuro-muscular condition. Chris told attendees at the Forum that Muscular Dystrophy Association covered forty different neuro-muscular conditions, including muscular dystropy. All are rare diseases. With the exception of Pompe Disease there was no cure or treatment for any of them. Chris went on to say that he was moved to hear other people’s stories; people who are directly affected by the issues; particularly Freda and Allyson and that it “grounded him back to reality”. He thanked the Forum for the humbling privilege of being invited to attend. Olivia is a director of HAE Australasia, which is a patient advocacy and support group for Hereditary Angioedema or HAE. Olivia said there were 40 known patients in New Zealand alone and possibly more undiagnosed. She said HAE is a swelling disorder that can have sudden onset. The condition is life-threatening; extremely painful; and an attack can take place in twenty minutes. There is only one treatment available in thre country. Olivia said there was often difficulty in explaining the condition to EDs at hospitals. Olivia said that her group is looking for both additional treatments both here in New Zealand and overseas, as well as better access to the one treatment already available. Lucy is a lawyer who has given assistence to John on various issues. Lucy said she she was also concerned at issues of morality and what sort of society do we want to live in. She said she wanted a society where people who were vulnerable had wrap-around services, rather than being isolated and having to fight the system. Lucy said there should be abilities for exceptional circumstances; where discretionary decisions can be made. Lucy said that Pharmac’s process did not provide for exceptional circumstances or funding for treatments outside their usual criteria. But listening to these cases, “is this not the exceptional circumstances they’re talking about“? She said there will always be people who are not the greatest number and who are at the margins with rare diseases. What kind of equity was there in a system that ignored their needs? Lucy voiced her frustration at a system that ignored people’s needs. She gave an example of ACC providing a better service if you were disabled through an accident than if you were born with it. These are things that reflect on our society. Lucy closed by saying she would be willing to offer her legal services to help in this area. There was instant laughter to this. Lucy declined to take the case. She did, however, make the point that there was a big difference to where only one drug was available for a rare disease than to situations where Pharmac had to consider a fourth generation drug over a third generation product already funded. In cases of rare diseases, there was no drug treatment being funded by Pharmac whatsoever. Their afflictions – many of them untreatable and terminal – had not affected their sense of humour. They were still able to crack jokes – often at their own expense. The people in the room were ordinary New Zealanders – mostly middle class; ages ranging from early 20s to 60; men and women. These were the “mums and dads” that politicians often refer to when seeking their votes at election time. And they are the ones who will most likely vote. These folk are not seasoned political activists. They are people that live next to us in our neighbourhoods; who pass us on the footpath; and stand in line with us at the supermarket. They are the face of New Zealand. And they have come up hard against The System and political intransigence. Gregory John Coyle: How does the operation of PHARMAC’s ‘Community Exceptional Circumstances’ policy align with the distributive justice principles of fairness and equity? PNH Support: Petition to Government to Make Soliris available to New Zealanders! Where purpose of use is commercial, a donation to Support for Jethro Morrow is requested. At all times, images must be used only in context, and not to denigrate individuals. Interesting stuff. You get the odd article in the paper about these folks doing it tough, but never much of a background story. They sound pretty inspiration to me! Amazing stories. I never knew we had this going on in our own country. You’d think that if the government can spend $1 million to advertise selling our state assets, they could find the money to fund treatment for these rare disorders. I hope you spread this story far and wide Frank! My heart goes out to these people and reaffirms to me how money-mad and selfish this government is. Key and Ryall should be ashamed of themselves. They can afford whatever medicines they need but others are not so fortunate. Key is a millioniaire so why should the misfortune of others and sick children bother him? If Key can give The Hobbit big subsidies why can’t sick people get the medicines they need? What is WRIONG with this country? I didn’t vote last time but will be voting next year. I just have to work out whether to vote Labour or for Winston. As always, well researched and reported, Frank. Doing the work of the mainstream media as usual, to keep us informed. I really hope we hope we have a change in government next year so these poor people can get the medicine they need. Thank you Frank for reporting this as I had no idea it was so bad! I won’t be voting for National again that’s for sure! How disgusting that this government can afford to give million dollars subsidies to Hollywood companies who then make billions in profits, but Key can’t find a fraction of that for New Zealanders in desperate need. The sooner he is gone the better. “One should judge a society by how it looks after the sick and vulnerable” – part rua Health and safety jobcuts? Haven’t we been down this road before? !